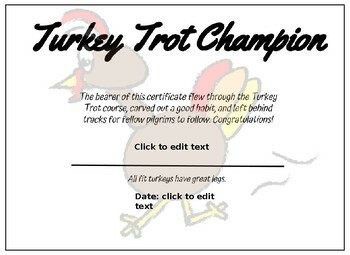 Our school does a Food Drive and Fun Run for Thanksgiving every year so I created these fun certificates for our top three male and female winners for each grade level. This is a PowerPoint file which you can open and edit with PowerPoint and also the free version of PowerPoint Online. Both the date and the name are editable on the file to allow you to put in your own students' names and date. If you enjoy this free product please submit a rating!